Chestnut trees, known botanically as Castanea dentata, are deciduous flowering and fruiting trees that produce edible nutmeats in the fall prized for roasting and cooking. Chestnut is a hardwood tree and the lumber is highly valued but often affected by blight diseases which have limited its planting and harvesting for timber. Chestnut benefits from annual applications of fertilizer that can be tailored to the specific tree and site needs by a soil test if you are in doubt about the soil condition. 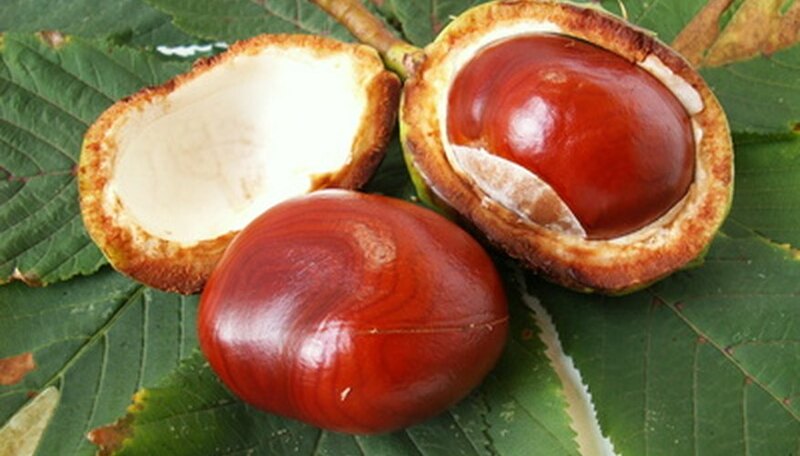 Feed your chestnut tree once per year in the spring after the last frost has passed and the soil is warm enough to be worked easily and absorb the applied water and nutrients. Use a complete granular fertilizer that is nitrogen-rich and has a guaranteed analysis of 30-10-10 or 20-6-6. Apply the fertilizer to the soil surface at a rate of 1 lb. for every 50 square feet of soil surface under the tree canopy. Cast the fertilizer with gloved hands or with a fertilizer spreader tool starting a foot or two out from the trunk and extending at least a foot beyond the outermost edge of the tree canopy. Nestle the fertilizer granules into the top few inches of soil with a rake or cultivating fork. Water the fertilizer and surrounding soil in deeply until the soil is drenched to a depth of at least 1 foot.